Aim: To determine the activation energy of the reaction between bromide ion and bromate(V) ion in acid solution. I. 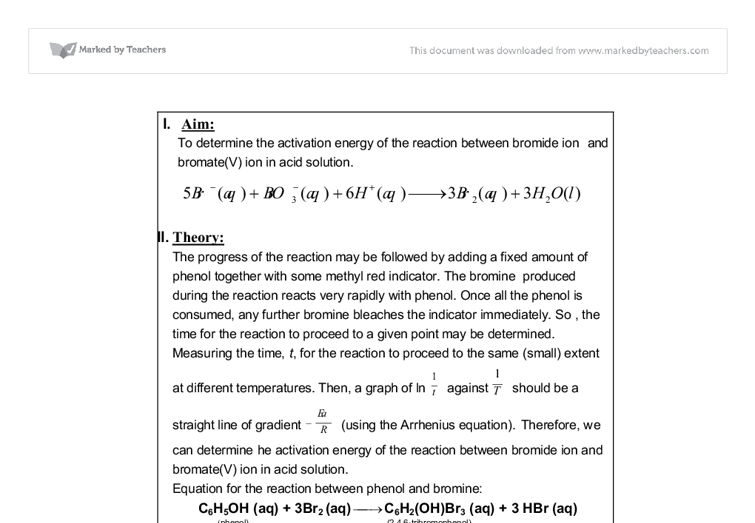 Aim: To determine the activation energy of the reaction between bromide ion and bromate(V) ion in acid solution. II. Theory: The progress of the reaction may be followed by adding a fixed amount of phenol together with some methyl red indicator. The bromine produced during the reaction reacts very rapidly with phenol. Once all the phenol is consumed, any further bromine bleaches the indicator immediately. So, the time for the reaction to proceed to a given point may be determined. Measuring the time, t, for the reaction to proceed to the same (small) extent at different temperatures. Then, a graph of ln against should be a straight line of gradient (using the Arrhenius equation). Therefore, we can determine he activation energy of the reaction between bromide ion and bromate(V) ion in acid solution. Equation for the reaction between phenol and bromine: C6H5OH (aq) + 3Br2 (aq)C6H2(OH)Br3 (aq) + 3 HBr (aq) (phenol) (2,4,6-tribromophenol) III. 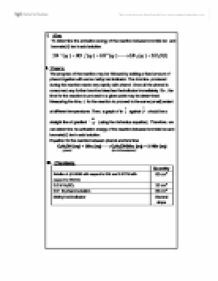 Chemicals: Quantity Solution A (0.083M with respect to KBr and 0.017M with respect to KBrO3) 60 cm3 0.5 M H2SO4 30 cm3 0.01 M phenol solution 60 cm3 Methyl red indicator Several drops I. ...read more.
 ? All concentration terms have been kept constant ? Rate only varies as k (rate constant) ? Rate is directly proportional to 1/t & varies as k in the rate equation ? We can substitute k by 1/t in : ln (1/t) = ln A - Ea�(RT), which is the equation of the previous graph From the graph, the slope is -6.7659 ? -Ea = (- 6.7659) (R) Ea = (-6.7659) (8.3) = 56.16 Jmol-1 VII. Discussion: 1. Why does the reaction not start until the contents of the boiling tubes are mixed ? There are three reactants in the reaction, i.e. Br-(aq), BrO3-(aq) and H+(aq) ions. The three reactants are put separately in the two boiling tubes. If the contents of the boiling tubes are not mixed, the three reactants are not mixed and the reaction will not start. 2. What is the function of phenol in this experiment? The reason for adding a small amount of phenol at the start is that it will react with the bromine formed early in the reaction. ...read more. Conversely, lowering T makeslarger, then k will decrease and the reaction proceed slower. Similarly, if Ea is low,will be small. Then, k will be large and the reaction will be fast. If Ea is high, will be large. Then, k will be small and the reaction will be slow. 8. Explain the fact that the reaction with low activation energy proceeds faster. If the activation energy is low, more collisions between reactant particles would have collision energies higher than activation energy (the minimum energy for the reaction occurs). In other words, there are more collisions between reactant particles are effective. 9. Errors -Temperature is recorded when the solution bleaches. However, the reaction temperature would vary throughout the reaction period, especially if the reaction starts before the temperatures of the solutions become steady. Therefore, if the temperature is lower, we should put the boiling tube in the water bath; if the temperature is higher, we should get out the boiling tube from the water bath. -If the reaction may not be stirred well, the reaction mixture may not be homogenous, and this will lead to a greater time reading. VIII. Conclusion: The activation energy of the reaction between bromide ion and bromate(V) ion in acid solution is 56.16 Jmol-1 ...read more. I am using titres of approximately 30cm3. I will need some sodium carbonate solution to rinse the burette, solution to do a rough titration, and I will want about 5 titres worth to get 3 accurate titres so I will need (7x30)= approximately 210cm3 of sodium carbonate solution. This theory suggests that reactions occur when the particles of reactants collide, provided that they collide with a certain minimum kinetic energy. Concentration of Reactants: If the concentration of the reactant molecules is increased there will be more molecules. After the addition of starch, the mixture turns deep blue. Hence if the end point was only detected by the color of iodine in iodide (the change in color 'brown-->yellow-->colorless', there would be a large percentage error, provided that this kind of end point is very difficult to observe. As the number of effective collisions decrease, the rate of reaction would decrease, signaled by the increase in time taken for formation of the blue-black solution. The presence of delayer - thiosulphate - would not have a net effect on the reaction because the concentration of thiosulphate is fixed throughout the experiment. Repeat the similar procedures as in step 1 of Part C by using HCl instead of NaOH. Measure & record all the pH values at 0 cm3 , 1 drop , 1.0 cm3 and 5.0 cm3 in Table 1.